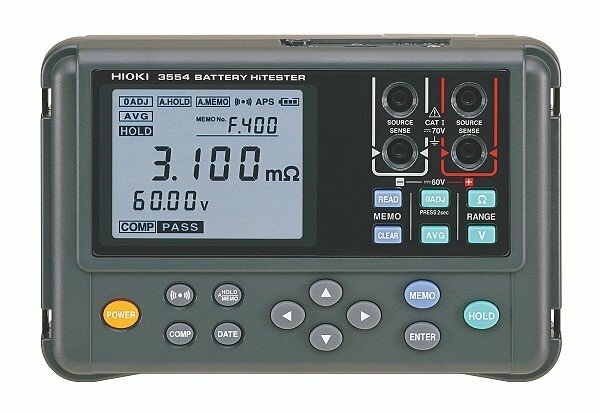 Hioki 3554 BATTERY HiTESTER quickly diagnoses the condition of lead-acid batteries by measuring the internal resistance and voltage of batteries used for backup in UPSs and emergency power supplies in the field, without shutting down the system. The four-range design covering 0.001 mΩ to 3.100Ω enables easy measurement of the mid- and high-capacity sealed lead-acid batteries in these devices. By simply specifying primary and secondary limits for the battery resistance and the minimum voltage threshold, the battery tester quickly displays Pass, Warning or Fail based on the combination of reference values, for fast and accurate assessment.